Today was my birthday, so when I meandered onto Facebook this morning I was greeted with the usual birthday wishes from friends and family members, accompanied by cute pictures of the Beatles...and Beetles (as in VW.) However, nothing could have prepared me for what is undoubtably one of the most far out, grooviest birthday presents I've ever received in my 44 years on this planet. I was immortalized as a retro style cartoon. Pete Emslie is an uber-talented cartoonist and illustrator that has gotten paid for what he loves doing best for over 30 years. That includes working for the freaking Disney Company! 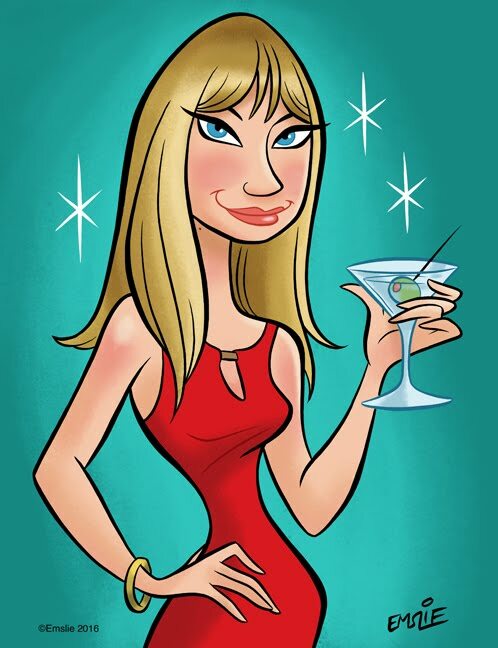 Pete's been a reader and fan of Go Retro for a few years now, and he also showcases his talent on his own blog, The Cartoon Cave, perfectly capturing the physical characteristics of both retro and modern celebrities with his uncanny caricatures. Please check it out, especially if you're a fan of animation and caricatures; it's so much fun to see his illustrations. The fact that I'm now on the same blog as David Bowie, Frank Sinatra, Bobby Darin, and countless other celebs in the same illustrated form has blown me away! Not long ago, I was looking into artists posting their services on the site Fiver to have someone illustrate my photo in a Roy Lichenstein or other retro style. The one guy I liked the most was on vacation, had a long wait list, and never responded to my email. The others just didn't seem as talented. Now not only have I received a caricature by an artist that's a thousand times more talented than those guys, but I got it for free! Thanks, Pete, for capturing me so brilliantly in a retro-style portrait. It's seriously one of the best things to happen to me ever since Paul McCartney flashed the peace sign back at me at a concert in 2002! Well Pete, I'm truly touched...first by the gift and now by your kind words. Thanks so much. I truly did feel like a celebrity today with all of the attention the caricature got on Facebook. I'm thinking 2016 is definitely shaping up so far to be a good year. Look at YOU!! I think Pete captured you perfectly (or, what I think you are like based on our mutual appreciation for retro/vintage). And, happy birthday, Love! I second everything Pete said about you in his comment. Dr. Julie Ann, it's so great to hear from you! Thank you so much for the kind words and birthday wishes. Wow, I've been catching up on your site and I love the look and the current Glamorous Whole Life Makeover Project series you've been posting -- this is really awesome, positive, motivating stuff! I just signed up for your newsletter so that I don't miss any more posts. Hope you had a nice birthday Pam! I'm still shaking my head over Pete Emslie's artwork, he REALLY did a great job of capturing you--my jaw dropped when I first saw that this morning! Thank you, Doug...I did have a really nice birthday. Your reaction to the portrait Pete made was the same as mine. Really just outstanding! Happy birthday Pam. And Jessica Rabbit ain't got nothing compared to that fantastic drawing of you!